Meat Loaf's Bat Out Of Hell has been voted motorists' favourite driving tune, according to an AA/Populus survey. Queen's Bohemian Rhapsody was in second place, with Abba's Dancing Queen third in the AA/Populus poll of nearly 16,000 AA members. Two Chris Rea hits - Driving Home for Christmas and Road to Hell - were in fourth and fifth place in the table. Another Queen hit - Don't Stop Me Now - which was in eighth place, was the favourite song for those aged 18 to 34, while Dancing Queen was most popular with those aged over 65. AA president Edmund King said: "There is a long tradition of music and driving. Music can help reduce boredom and frustration on long, congested journeys. "Our members seem to be nostalgic for the good old days when petrol was 17p a litre (78.20p a gallon) when Bat Out of Hell was released in 1977. Bohemian Rhapsody comes second in the chart and, perhaps, the opening lines (Is this the real life? Is this just fantasy? Caught in a landslide, No escape from reality) sums up the thoughts of today's motorist faced by increased tax, hold-ups, potholes and sky-high fuel prices." 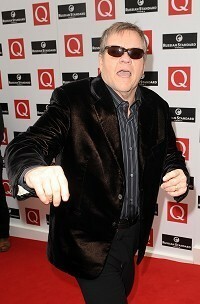 James Corden has said he hasn't taken any presenting tips from Ricky Gervais for his hosting gig at the Brit Awards. Tinie Tempah, Plan B and Mumford And Sons will be hoping for glory tonight at the UK's biggest music bash, the Brit Awards. Court records show Christina Aguilera and music executive Jordan Bratman have finalised their divorce. Formula One ace Lewis Hamilton has lapped up the chance to join stars such as Cheryl Cole and Kylie Minogue as a presenter at the Brit Awards. Radiohead are to release a new album The King Of Limbs by the end of the week - and are again bypassing major labels. Florence Welch, Christina Aguilera and Jennifer Hudson will be performing a "get well" tribute to Aretha Franklin at the Grammys, it has been announced.